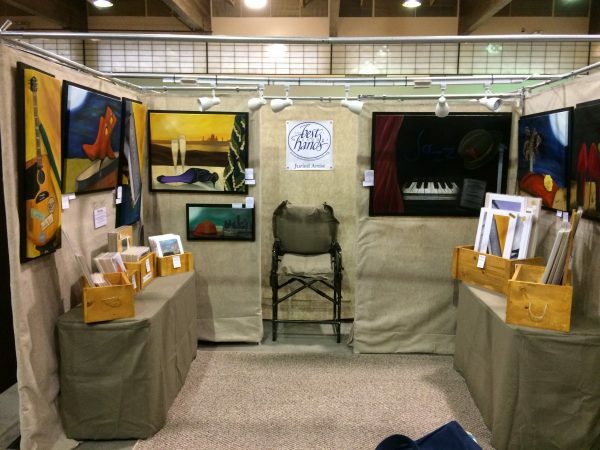 My last show, I set up my booth with pride and “storage”. What I failed to do was step back and look at how it looked to the customers. When I realized that it was not the gallery effect that many expect, it was too late. Many of my pieces are large and needed more room. Two other artists suggested that I use Pro Panels instead of the Mesh Panels. Mesh Panels are totally awesome, but not what I needed and, for what I was trying to accomplish, it was taking too long to set up and not giving that professional look. So, that was last weekend and on Monday, I started searching for used Pro Panels. These systems are highly prized and hard to get used. I searched and posted questions and searched more. Finally, I found a post on a site that had the exact color I wanted, all the extra parts I wanted and enough for a double booth…for a price I could afford. But, it was in Colorado Springs, CO and I am in Springfield, MO…that’s a 11 hour drive each way. But, for what I wanted…DONE! deposit down and pick up this weekend. So, I left 6 am Saturday morning and headed to CO. My plan was to drive the, pick up and drive back. Most of that went as planned. Soon as the sun went down, Saturday night, I realized that driving at night was not my friend and I peter’d out at Motel 6. My plan there was to stay up long enough for Tom Bodett to arrive and tuck me in…but I fell fast asleep. Six hours later, I was up and on the road again. My art van’s cruise control is broken. It’s very windy in E. Kansas. I don’t like the smell of manure in the morning. Kansas does control burns every spring. Very effective, but makes the landscape look like a shaved black cat. Most of the property between here and Clinton, MO has tan metal buildings with green metal roofs. Kansas and Colorado are big on Wind Turbines. I am a new fan. These are the most elegant, graceful, awe-inspiring creations I think I’ve ever seen – especially against the sun coming up. I-70 is a very amazing highway with very little traffic on it. Missouri and Kansas’ sections are very well maintained. Colorado? Not at all – bumpy, so much so that my phone fell out of it’s holder on many occasions. “Pot” holes? not really, just not maintained. Driving for many hours on end gives you lots of time to think about your life and love. One of my goals in life was to live in Colorado, as my son is very well aware of. But, after two visits to Colorado Springs (1st in mid-80’s and recently), as beautiful as it’s backdrop is, I was overjoyed to be home back in the Ozarks. No mountains in the horizon; no breathtaking skies to make my jaw drop, just HOME, where my grandson and loads of friends are. I can’t wait to set up my new Pro Panels. Pictures to follow in the next couple of weeks.